What Would You Include in a Children's Book About the Ancient World? 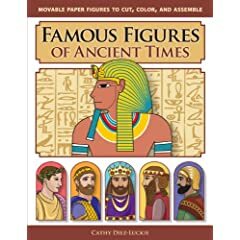 Cathy Diez-Luckie is the author of Famous Figures of Ancient Times: Movable Paper Figures to Cut, Color, and Assemble. Can a child of the 21st century imagine the way people lived 2,000 or 3,000 years ago? This was one of the questions I pondered as I started writing Famous Figures of Ancient Times. The ancient world had no cars, phones, or televisions. It consisted of small remote settlements with vast open or wooded areas between them. Yet despite this seeming lack of sophistication, they managed to spawn incredible feats of engineering, such as the Great Wall of China and the Pyramids of Giza. How could I make this rich history come alive for today’s children, who are more comfortable with planes than parchment? By creating the book, I hoped to tap into the imaginations of young children and make them history fans for life. My goal was to make the world of the ancients approachable and exciting for even the youngest child. Before they are old enough to write essays and memorize dates on a timeline, children can learn about people who have shaped our world. They can act out the story of Julius Caesar, including his kidnapping when he was a young man, or the story of Hannibal as he crossed the Alps with his elephants. I wanted to create a book that would give them the opportunity to engage with history by constructing movable figures that help them picture what the person may have looked like and see how he or she dressed, making each person more real and memorable. In addition, with the movable figures, they can act out historical events, using their imagination to explore the lives of people who lived hundreds or thousands of years ago. They can have a conversation with Aristotle or imagine what Caesar Augustus would say if he came to visit them today. I included a brief biographical note on each famous person, providing youngsters with a starting point for their imaginative play. As I started to select the ancient figures to include in the book, I had a hard time deciding which ones to include or leave out. It seemed there were too many notable ancients to choose from, and I simply did not have enough room to include everyone. After much deliberation, I decided to leave out Ramses II, Tutankhamun, and other well-known Egyptians, though I thought it would be interesting to include one of Hannibal’s elephants. The story of Hannibal and his elephants surprising the Romans was a story that every child should know. One of the biggest questions about the book has been, “Where are the ancient women?” I admit it was a mistake to leave them out. I should have included at least one famous woman, such as Hatshepsut, Esther, Lei-Tzu, Cleopatra, or Ruth. To address this oversight, I am currently developing stories about several women to include in the ancients series that will be available on my website. After selecting the 20 figures to include, the most challenging (and rewarding) part of creating the book was conducting research about these renowned historical figures and ensuring that I accurately represented them. I researched costumes for the time period in which each person lived. In addition, I located statues, mosaics, and paintings of the individuals and referred to them as I created the illustrations. I also studied literature about each person to learn about the color of the person’s eyes, hair, etc. I faced challenges when creating illustrations of historical figures like Moses, King David, and others where there are no paintings, mosaics, or statues to use as reference material. I addressed this quandary by researching clothing from the period and representing the figure in the best possible likeness. For example, the illustration of Moses was based on a woodcut by Gustave Dore. Also, when rendering the illustration, I could not write the words of the Ten Commandments in ancient Hebrew myself, but attempted to copy the Hebrew figures on the tablets with a digital stylus. I also found that some representations of historical figures are not accurate. For example, Augustine (of Hippo) is sometimes represented by artists as living in a later time period than he actually lived. If you look for portraits or statues of Augustine, who lived from 354 A.D. to 430 A.D., you will find that many representations show him wearing a bishop’s mitre. Mitres were first used in Western Europe around 1000 A.D., and depicted in small statues at the beginning of the 11th century. It was not until 1150 that the mitre was used widely by bishops throughout the west. While artists have always had freedom to paint portraits as they wish, I prefer to use clothing for the time period in which the individual lived. Putting a mitre on St. Augustine is probably not accurate, but it may instead portray the artist’s feelings of Augustine’s importance in the history of the church. After researching and considering many possibilities, I decided to depict him without a mitre and in simple clothing, holding a book made out of parchment and a pen formed from bamboo stems (first made by the Romans). As an artist, I enjoy creating detailed, engaging illustrations. However, for this book, my goal was to create simple line sketches with minimal shading, enabling young children to color and cut them out, creating a movable figure they can play with. Though I would have loved to create highly complex illustrations, instead I focused on creating simple, yet accurate illustrations that connect with children. Famous Figures of Ancient Times provided me with the wonderful opportunity to blend my love of history with my passion for art. Through art, we can make history more real, creating images of a time before cameras existed. We can also use art to capture the imagination of a young child, putting realistic, movable figures into their hands that make it possible for them to help Emperor Qin Shi Huangdi build the Great Wall of China or journey with Alexander the Great on his conquests of the ancient world.